When Ravdeep’s mother first heard that her son is going to take up farming, she was deeply disappointed. Standing in his farm in Punjab’s Pharwahi village in Barnala, Ravdeep remembers with a smile: “She said all the resources and efforts she had put into my education had been in vain.” But she also knew and took pride in the fact that her son could successfully meet the most difficult challenges. Ravdeep proved it was true when farming became his means of livelihood. Then a friend gave him agriculturist Subhash Palekar’s book on natural farming. Ravdeep also got in touch with Kheti Virasat Mission (KVM), a non-profit working for farmers’ rights and food security that regularly conducts organic farming trainings. Punjab ranks third in rice production in the country with 2.97 million hectares of the land under rice cultivation. 2.5 percent of human induced climate change in the world is estimated to have been contributed by flooded paddy fields. 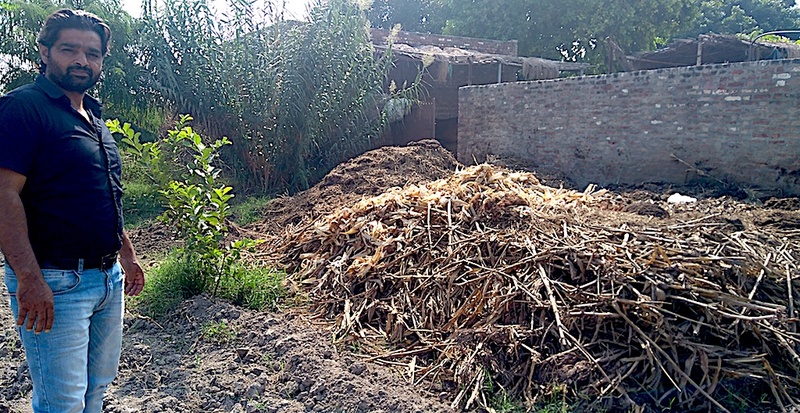 He also blames paddy growing for being the original cause of stubble burning in Punjab, leading to polluting and warming of the atmosphere: “In fact the Punjab Agricultural University, based in Ludhiana, which is now advising farmers against burning, is the one that started doing it years ago.” Farmers say they cannot use machines or labour to remove the stubble because of the expenditure involved. But Ravdeep has a different take. He feels the cost one pays for illnesses like asthma or when injured in an accident caused due to decreased visibility because of smoke is much higher. Farmers need to see economics in its full picture, he insists, and not just have a short term vision. After all these issues, Punjab has had to face rejection of export consignments because of pesticide residue in the rice. “The farmers who grow this rice do not eat it themselves. It is bought by the Food Corporation of India for distribution. People in south India like their own varieties. So why are we still growing it,” laments Ravdeep. Following farmer-philosopher Masanobu Fukuoka’s book The One-Straw Revolution, on Ravdeep’s six-acre farm, he is growing multiple crops, vegetables and fruit and flowering trees. They are not water intensive, and growing them organically has brought back the birds and insects that are killed or driven away by chemicals. In awe of this rich biodiversity through which his farm is making itself climate resilient, Ravdeep confesses that before this he had seen this feature only in the fields of his predecessors. Stubble is “food” for his crops and so he even collects the straw from his neighbours’ fields, which the farmers are only too happy about. Ravdeep, like many other organic farmers, end up selling some of his produce in the common market. Wheat and pulses get the rates deserving of organic produce. He says 5-10 percent of the customers are ready to buy organic food at the correct price, though all agree that chemicals are bad. But in this small percentage there is a mix of “rich, lower middle and middle classes”, explains Ravdeep, depending on how serious they are about their family’s health or whether there has been an illness in the family. KVM, which Ravdeep is connected with, has a shop in the area but it is open only once a week. Private buyers who get to know of organic farmers also buy from them directly. But Ravdeep says he could not have pulled it off without his family’s support. His wife, who is a teacher, and his daughter help with processing some of the produce at home before it can go to customers. “If I had to go out for processing, the cost and logistics of it would not have worked out”. Therefore Ravdeep recognises that a farmer cannot make a sudden shift to organic farming, and underlines the need for government to incentivise organic agriculture, and to provide markets for those who are already doing it.